The hottest team in the NHL at the moment appears to be the Vegas Golden Knights who have gone 10-1 over their last 11 games as of March 22nd. Coincidentally or not, their recent hot streak began with the arrival of right-winger Mark Stone from the Ottawa Senators on trade deadline day Feb. 25th. Before the deal, Vegas had lost six of their previous seven games. The 6-foot-4-inch, 220 lb native of Winnipeg, Manitoba hasn’t been giving opposing goaltenders sunburn since suiting up in Sin City, but he has been consistent with four goals and four assists in 11 outings along with a plus-4 rating. He’s been scoring at a pace of 0.73 points per game with Vegas while notching 1.05 per game in Ottawa with 28 goals and 62 points in 59 contests. However, he’s been playing an average of three minutes less per game with his new teammates. Whatever way you slice it, Stone’s on pace for 36 goals and 78 points in 78 games this year and a mark of plus-19. The main reason he’s seeing less ice time under Golden Knights’ head coach Gerard Gallant is simply because Vegas has plenty of talent to spread around wheres Ottawa didn’t. Gallant rode Reilly Smith, Jonathan Marchessault and William Karlsson as his top line in the club’s debut season and exceeded everybody’s expectations by reaching the Stanley Cup Final. It was more or less a given that trio’s production would slip slightly in 2018/19 and to nobody’s surprise it has. 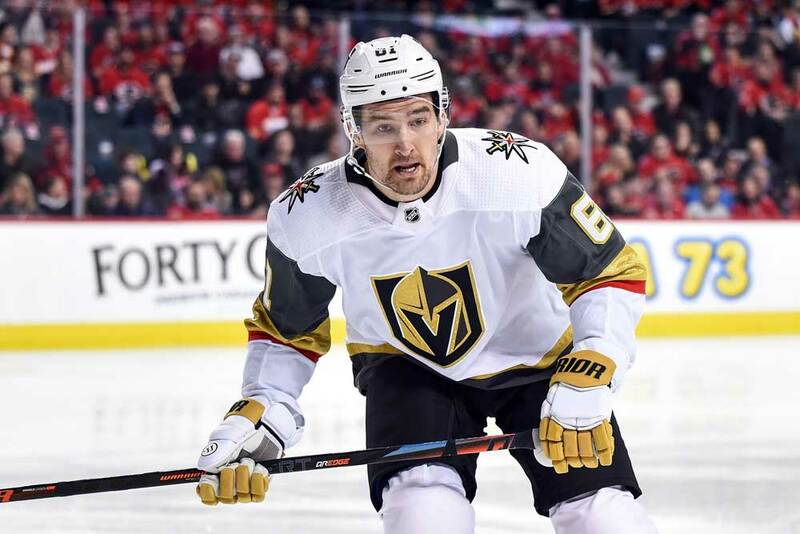 The team also lost the services of David Perron and James Neal to free agency during the summer and made a questionable move in trading Tomas Tatar, Nick Suzuki and a second-round draft pick to the Montreal Canadiens for Max Pacioretty. Vegas made up for the loss of offense by signing free agent Paul Stastny and even though Pacioretty, started slowly he’s on pace for 25 goals and 44 points in 69 games. But the final piece of this season’s puzzle has been the acquisition of the 26-year-old Stone for forward Oscar Lindberg, defenseman Erik Brannstrom and a second-round draft pick in 2020. Ironically, the Vegas’ newcomers Stastny, Pacioretty and Stone are playing together and have formed one of the league’s best second lines. The trio has been outscoring the opposition on a regular basis as well as controlling shot attempts and scoring chances while on the ice. Stone basically flew under the radar in Ottawa since he was playing for a small-market team as well as one of the league’s least productive clubs over the past few seasons. His story has actually been a successful one though especially considering he wasn’t drafted until the sixth round by Ottawa in 2010 with the 178th overall pick. He’s now currently the eighth-highest scorer of that draft class. Stone racked up 296 points in 232 games as a junior with the Brandon Wheat Kings of the Western Hockey League and starred for Canada at the World Junior Championships with 10 points in six games in 2011/12. He also paid some dues in the American Hockey League with the Binghamton Senators with 30 goals and 79 points in 91 contests and a point a game in seven playoff outings. In 2015/16 Stone finally cracked the Senators’ roster as a full time player and posted 26 goals and 64 points as a rookie with a plus-21 rating. He also had seasons of 23, 22 and 20 goals and is up to 32 this season. He has great hands, hockey sense, and shot, but doesn’t play an overly physical game for his size and his skating has been questioned. Still, he’s not one to shy away from the rough stuff if somebody else initiates it. The Knights did their homework when landing Stone and that’s why they didn’t baulk at paying the pending unrestricted free agent $9.5 million a year against the salary cap until the end of 2026/27. They knew he was a hard-working player at both ends of the rink and could contribute to the power-play as well as score timely goals, with 19 of his first 123 NHL markers being game winners. When it comes to his defensive play, Stone should garner some consideration as a finalist for the Selke Trophy as the league’s best defensive forward. If he does win it, he’ll become the first winger to capture the silverware as it’s only been won by centers up to now. Stone’s been credited with 107 takeaways so far this season and has led the NHL in that category five times in his half dozen campaigns. His hand-eye coordination and hockey sense are exceptional as he appears to have a sixth sense on the ice and knows precisely where the opposition is going. There’s no doubt this has been the best year of Stone’s pro career and as a bonus he seems to be the perfect linemate for Stastny and fellow winger Pacioretty. In hockey terms, the trio isn’t exactly spring chickens though. This means the Golden Knights window of opportunity is sooner rather than later with them in the lineup. General manager George McPhee should be given some credit for going for glory from day one since the franchise arrived in Vegas. He’s put together a team with the objective of challenging for the Stanley Cup now instead of some time down the road. The Smith/Marchessault/Karlsson line is still intact and doing its job and Alex Tuch has helped turn the third line into a solid unit as well. Stone may never evolve into a 40 or 50-goal scorer, but he’ll always be able to deposit the puck into the net at a steady rate. When combined with his defensive acumen he may be just what the doctor ordered as the Golden Knights try to improve on last year’s playoff showing. And if they do better last season’s performance it’ll mean Stone and his new teammates will be skating around the rink with the Stanley Cup in a couple of month’s time.